'Newsjack' alert for writers: National Pasta Day is fast approaching. According to the National Pasta Day website: “Marco Polo did not discover pasta in Asia and take it to Italy. 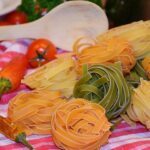 Early Romans used a very simple flour and water dough: pasta is Italian for ‘dough.’” Interestingly, Thomas Jefferson introduced pasta to the United States when he transported a … [Read more...] about National Pasta Day!